I rarely say this, and most artists live for this: Asheville prog rockers Marsupial, though fitting the genre, have their own unique style. On their latest project genus thylacinus (scientific name for an extinct marsupial), this quartet obviously draws inspiration from 70's rock, prog and otherwise, their southern roots, and maybe some rock-jazz fusion. The mix is not eclectic, but it is creative and more than a bit ingenious. On the progressive side, numbers like Lead On and Naked In the Hall Of Seduction are lengthy pieces which showcase all the performers. The music is not pretentious or bombastic, but rather leans towards melodic rock or AOR. Sometimes both songs (as well as others) seem merely to be canvases for the lead guitarist to paint. Yet, on the latter, the bass work is marvelous. Other offerings cover melodic rock (The Tide, The Goodbye Waltz) or near southern style, Allman Brothers, melodic rock and AOR especially The Man Who Know Things and There Is A Better World. At least one song, The Goodbye Waltz, was overly somber to the point of being depressing. My only reservation goes to the vocal performance which are mostly droll and have very little range. The lack of vocals on the the pseudo-pyschedelic heavy rock instrumental, Sucker Punch, makes it the killer track on the album. Overall, genus thylacinus in musical composition, is adventurous and so, quite intriguing and entertaining. 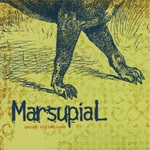 Marsupial's genus thylacinus is a great dose of southern styled melodic and progressive rock with enough imagination to defy category or genre pigeon-holing. Excepting the boring vocal performance, genus thylacinus is a marvelous and ingenious work.